A researcher examines the National Spherical Torus Experiment. PLAINSBORO, N.J. -- Hidden in the woods two miles from Princeton University's main campus sits a drab white building easily mistakable for a warehouse. Inside is one of the Ivy League school's most expensive experiments: a 22-foot-tall metal spheroid surrounded by Crayola-colored magnets. About half a dozen blue beams ring the sphere horizontally, while another set, painted red, rise vertically from the floor to wrap the contraption, like fingers clutching a ball. Last fall, construction workers hustled to finish an upgrade to yet another magnet, this one jutting through the center of the sphere like a Roman column. On a recent November afternoon, Michael Williams, the lab's head of engineering, weaved his way through workers and up a stainless steel scaffolding to get a better view. "Fusion is an expensive science, because you're trying to build a sun in a bottle," Williams said. This endeavor in the New Jersey woods, known as the National Spherical Torus Experiment, was created to study the physics of plasma, in the hopes that one day humans will be able to harness a new source of energy based on the reactions that power stars. The project has been shut down for two years to undergo an upgrade that will double its power. The improvement costs $94 million, and is paid for -- like the rest of the Princeton Plasma Physics Lab -- by the U.S. Department of Energy. Impressive as it may appear, this experiment is small compared to what once stood there. Earlier in the day, while walking over to the site from his office, Williams pointed out a sign on the National Spherical Torus Experiment building that read "TFTR." The abbreviation stands for Tokamak Fusion Test Reactor, a bigger, more promising fusion experiment that was scrapped in the mid-1990s. "I keep telling them to take that down," he said. The history of the U.S. Department of Energy's magnetic fusion program is littered with half-completed experiments and never-realized ideas. Currently, the most ambitious project in all of fusion work is the International Thermonuclear Experimental Reactor, or ITER, a collaborative scientific effort backed by the European Union and six other nations, including the United States. Once it's built in southern France, ITER will be largest fusion reactor ever. The plans for this project dwarf the three similar U.S. fusion experiments, including the one at Princeton, in both scale and expense. But ITER is sputtering with delayed construction and ballooning costs, and U.S. physicists are increasingly worried that their work at home, such as the National Spherical Torus Experiment, will be sidelined to fund the international project. 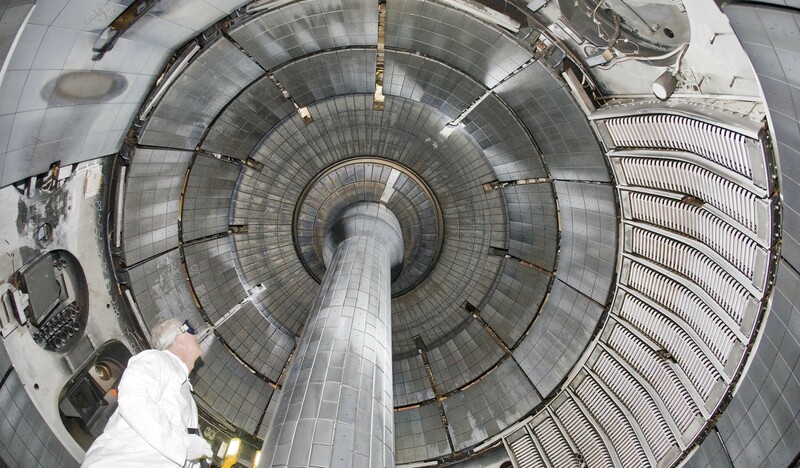 They see the domestic research as crucial to understanding the nature of the plasma used in certain fusion reactions -- crucial, even, to getting facilities like ITER built in the first place. Meanwhile, critics view magnetic fusion research as a money-wasting boondoggle that will never be able to produce energy as cheaply as methods like solar and wind power. After the visit to the facility, Williams returned to his office and I met with his boss, Stewart Prager, the head of the Princeton lab. Sitting in a tidy glass-paneled office overlooking the woods, he recalled an old joke about fusion -- it was "30 years away 30 years ago, and it's 30 years away now" -- and explained why the quip has taken hold. "The true pioneers in the field didn't fully appreciate how hard a scientific problem it would be," he said. But then he added: "Even having said that, if you look back at documents from the past, they laid out how much it would cost. That amount of money was never nearly delivered." Fusion scientists make an incredible proposition: We can power our cities, they say, with miniature, vacuum-sealed stars. According to those who study it, the benefits of fusion power, if it ever came to fruition, would be enormous. It requires no carbon drawn from the ground. Its fuel -- hydrogen harvested from seawater -- is inexhaustible. It emits no gases that warm the planet. And unlike its cousin fission, which is currently used in nuclear power plants, fusion produces little radioactive waste, and what it does produce can be recycled by the reactor. The only hurdle, as many U.S. physicists tell it, is the billions of dollars needed before the first commercially viable watt of power is produced. Researchers lament the fact that the U.S. hasn't articulated a date for when it hopes to have fusion go online, while China and South Korea have set timetables to put fusion online in the 2040s. A so-called magnetic confinement fusion reactor would work by spinning a cloud of hydrogen until it reaches several hundred million degrees Celsius -- at which point it would be so hot that no known material could contain it. Instead, high-powered magnets in a vacuum would envelop the ring of hydrogen plasma. Spun with enough heat and pressure, the positively charged hydrogen atoms, stripped of their electrons, would begin to overcome their usual tendency to stay apart. They would fuse into helium, spitting out an extra neutron. When those neutrons embed into a surrounding blanket of lithium, they would warm it enough to boil water, spin a turbine and make electricity. The long-term goal is to create a self-sustaining reaction that produces more energy than is put in. The oil shortages of the 1970s kick-started federally funded fusion research. When petroleum-pumping nations in Middle East turned off the spigot in 1973 and then again in 1979, much of the world, including the U.S., was rattled by gas shortages and high prices. With Americans waiting in mile-long lines to fill up their tanks, there was a keen national interest in finding any fuel to replace oil. The crises prompted Congress and President Jimmy Carter to create the Department of Energy, which immediately began to channel funding into alternative energy programs, including fusion. By the end of the '70s, experimental reactors were being built at the Massachusetts Institute of Technology and at Princeton -- including the latter's Tokamak Fusion Test Reactor, the "TFTR" whose outdated sign Michael Williams now walks past. 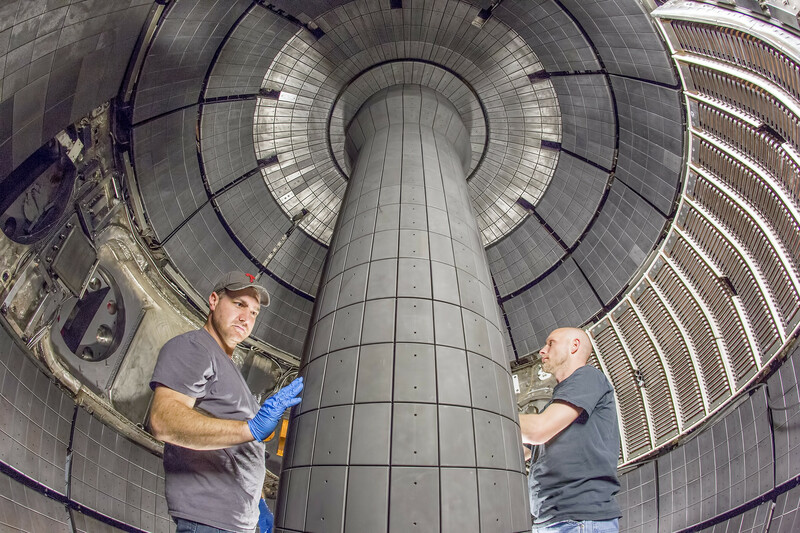 Adjusted for inflation, the U.S. was spending over $1 billion per year on magnetic confinement fusion research by 1977, according to Department of Energy figures collected by Fusion Power Associates, a nonprofit that promotes fusion research. But by the time Ronald Reagan was elected president in 1980, gas prices had dropped. Eyeing cuts to government spending, Reagan and his Republican colleagues in Congress tightened funding for research into fusion and other alternative energy sources. "The Republicans hated the Department of Energy because they were messing around with the private sector energy business," said Steve Dean, a former Department of Energy official who oversaw fusion experiments in the 1970s and now runs Fusion Power Associates. In 1984, however, as the Cold War thawed, Reagan inked a deal with the Soviet Union, along with Europe and Japan, to fund and build what would become ITER. India, China and South Korea would eventually sign up as well. And even with the downturn in U.S. funding, investments made in the '70s started paying off. In 1994, Princeton's TFTR produced what was then a record-breaking 10 megawatts, enough energy to keep 3,000 homes lit for... well, for nearly a second. Actually, less than one second of power is a bigger deal than it might at first seem. Fusion research can only advance in baby steps across generations of scientists, say experts. First, their goal is to build a multimillion-dollar reactor capable of sustaining plasma for a second. Then, perhaps within a decade of achieving that, their goal is to construct yet another reactor that keeps the plasma going for a minute. It's all part of a painstaking march toward creating a self-sustaining reaction that lasts indefinitely. "One would have expected these ground breaking results to lead to an upsurge on fusion funding in the U.S.," said Dale Meade, the former deputy director of the Princeton lab, in an email to HuffPost. "It didn't." Several months later, in Washington, D.C., then-Rep. Newt Gingrich (R-Ga.) gaveled in his first session as Speaker of the House. The GOP-led Congress soon slashed spending yet again in order to balance the federal budget. "It was a lot of people losing their jobs and being knocked out of the field," said Raymond Fonck, an experimental fusion physicist at the University of Wisconsin who did some work on TFTR. "Some people left the field out of disgust." Overnight, funding for magnetic fusion research fell by 33 percent -- some $173 million in today's dollars. Princeton's TFTR was shut down. Plans for a new machine to be built where TFTR stood were postponed indefinitely. (Today, the National Spherical Torus Experiment stands on that site.) And the U.S. pulled out of its agreement to help fund ITER, citing cost concerns -- only to rejoin a few years later. 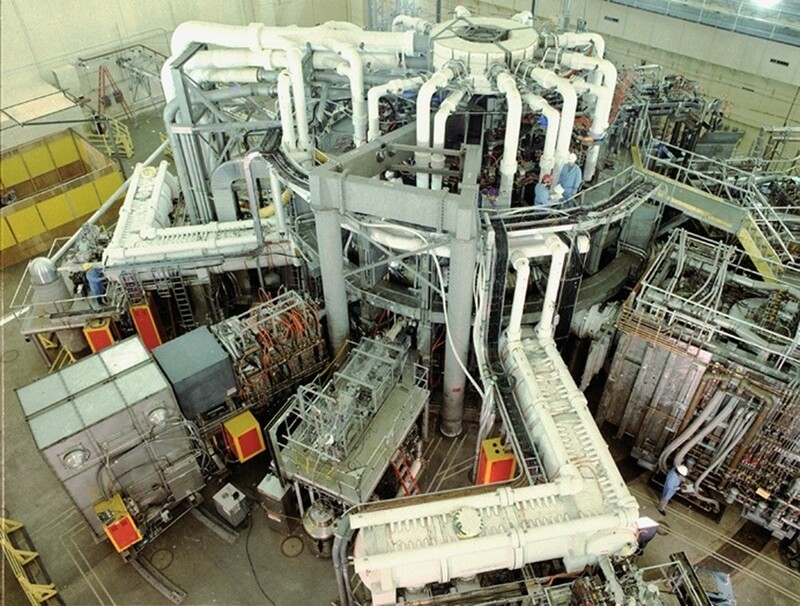 The magnetic fusion program "never really recovered from that budget cut," said Meade. Data source: Department of Energy via Fusion Power Associates. 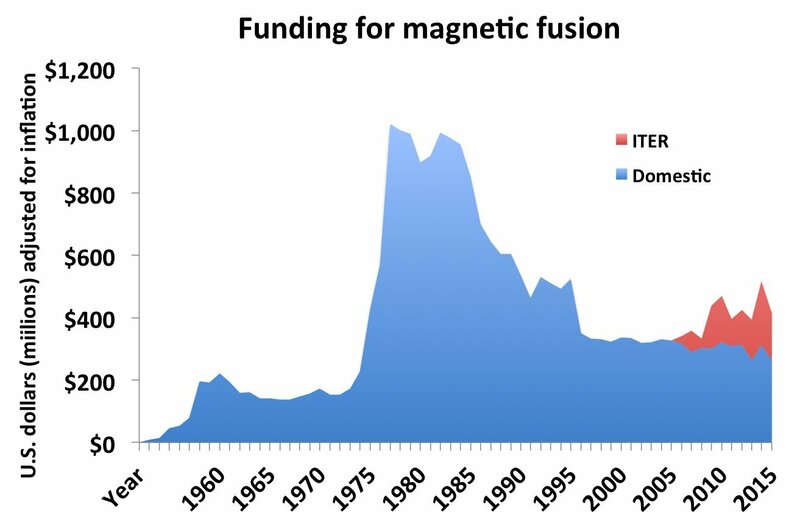 Magnetic fusion researchers received $505 million from the federal government for the 2014 fiscal year -- about half of what they used to get, when adjusted for inflation. About $200 million of that pot went overseas to help build ITER. And even with the downturn since the 1980s, critics still say the program receives too much funding given that it has yet to build an economically viable reactor. "The magnetic fusion energy program is one of these programs that gets a steady flow of money like clockwork, although it may not receive on a constant dollar basis what it used to," said Robert Alvarez, a former senior policy adviser for the Energy Department who now works at the Institute for Policy Studies, a Washington think tank. "But it still commands a great deal of money in the energy research and development portfolio. You've got to ask yourself: When is it time to fish or cut bait on this?" Alvarez and other skeptics believe that magnetic fusion will never be inexpensive enough to compete with other sustainable energy sources, because new fusion reactors require billions of dollars to build and decades to complete. "At $10 to $20 billion a pop, it just doesn't lend itself to innovation like wind or solar," said Thomas Cochran, a consultant with the Natural Resources Defense Council. He added that the "people who are closest to the technology" are unable to see the dead ends. While money for magnetic fusion was cut during the '90s, funding for an alternate form of fusion, called inertial confinement fusion, took a dramatic leap. After the U.S. signed a treaty banning nuclear weapons testing, Congress paid for the construction of the world's largest laser 40 miles east of San Francisco, designed to compress a pellet of hydrogen with enough heat and pressure for its atoms to fuse into helium. The laser-based approach to fusion is meant to offer both a potential new energy source and a way to develop hydrogen bombs without actually blowing anything up. Its early years, however, have not been entirely trouble-free. After falling five years behind schedule, going three times over budget and failing to achieve its 2012 goal of producing a self-sustaining reaction, the laser was labeled a fiasco by critics. Finally, though, the lab was able to produce its first significant fusion reaction in 2013. Although magnetic fusion is further along, the stumbles of inertial confinement may have given all of fusion research a black eye. With magnetic fusion, the Department of Energy is under yet another budgetary constraint today. Eleven years behind schedule and crippled by decentralized management, ITER is becoming increasingly expensive. The U.S. is obligated to fund about 9 percent of the project, and what was once a $1 billion commitment is swelling beyond the $4 billion mark. With Congress gridlocked, the money must come from within the department. In October, a Department of Energy advisory committee floated the idea of shutting down the fusion reactor at MIT, and, if necessary, shutting down one of the two other experimental reactors in the U.S. (the one at Princeton or another at General Atomics in San Diego). Even though the resolution was non-binding, the decision drew the ire of many fusion physicists. Fifty experts signed an emphatic letter to the department saying that the "underlying strategic vision that guides this report is flawed." "The DOE is committed to creating opportunities for its fusion researchers to assert strong leadership in the next decade and beyond," said Ed Synakowski, the associate director at the Department of Energy who oversees fusion funding. He said that while the department has proposed closing the MIT lab, it would close one of the other two reactors only under dire budgetary conditions. Earlier this year, the Obama administration slated the reactor at MIT for closure. An aggressive lobbying effort by Massachusetts politicians was the only thing that kept it open. The possible closures have put the fusion community on edge. But what some find more worrying is the idea that the young scientific minds needed to tackle this multi-generational problem will instead look for careers in disciplines that are better funded and more stable. "The older generation," said Fonck, "we get concerned that the younger generation will say, 'Well, there's no jobs in this field.'"